If you want to charge your fitbit versa,you need to take off your cover for Fitbit Versa. -99% transparency provides original viewing quality. -It is not easy to be deformed and turn yellow. -TPU soft case offer shockproof protection from the impact of accidental falls or drops. 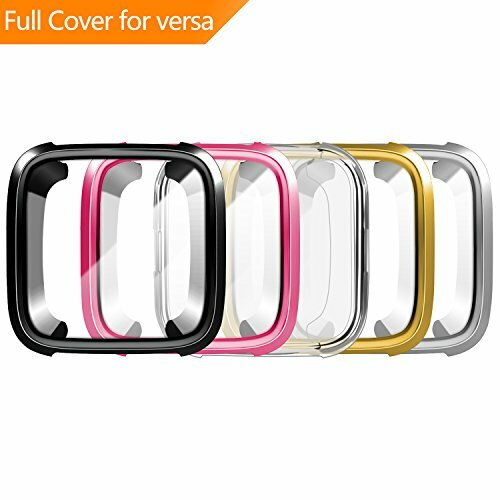 -Full protection case keeps your surface of Fitbit Versa from scratches and dust. -Easy access to press the buttons with your finger without taking down the case. -High touch-screen accuracy and sensitiveness. -When you need to charge your Fitbit Versa Smartwatch,you need to remove this case. -When you want to wash it,it is easy to take it off. If you are not 100% satisfied with our fitbit versa case for any reason, please contact us. No questions. No charge. No kidding. Fyoung provide 12-Month Worry-Free Warranty and Unconditional 45-Day Refund & Free Lifetime Technical Support. ✔[New Design available]This tpu case is specially designed for Fitbit Versa Smartwatch.Detachable case provides fully protection.Corners are guarded with Air Cushion Technology that take all the shock from everyday impacts.High transparency preserve original look of Fitbit Versa. ✔[PREMIUM IMPORTED MATERIAL]With environmental-friendly TPU material,it feels comfortable and sleek,never slide the hand or leave any finger printed.With great hardness and flexibility,it is not easy to be deformed and turn yellow. ✔[HYBRID ANTI-SCRATCH]The Ultra Hybrid combines a shock-absorbing flexible bumper with a rigid back to maximize defensive features.It can handle impacts and anti-shock bumper and greatly protect the Fitbit Versa from accident drops,falls and scratches. ✔[WITHOUT COMPROMISING FUNCTIONALITY]You can easily press any buttons without taking down the case.The buttons on the Versa can be accessed while charging.High touch-screen accuracy and sensitiveness. ✔[100% QUALITY GANRANTEE] If you are not 100% satisfied with our tpu case for any reason, please contact us. No questions. No charge. No kidding. Fyoung provide 12-Month Worry-Free Warranty and Unconditional 45-Day Refund & Free Lifetime Technical Support. If you have any questions about this product by FYOUNG, contact us by completing and submitting the form below. If you are looking for a specif part number, please include it with your message.